The first time I picked up this book, I read about 20 pages and then put it down. I just couldn't get into it for some reason. I guess I wasn't in the right mood. Then I decided to pick it up again. It started off very slow, just like I had thought when I picked it up the first time. But I NEEDED to read this book to find out what all the hype was about. Boy am I glad I kept reading! This book is so fantastic! All the characters were amazing. And Cath and Levi?! They were so stinking cute! Like, I absolutely love them together! The only thing that I didn't like was the ending. I really wanted to know what happened with her FanFiction she was writing. Overall, I gave this book 5 stars, but more like 4.5. 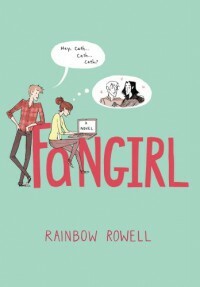 I can't wait to read more things by Rainbow Rowell!